Mike Fuljenz is a Board member of the Industry Council for Tangible Assets and the Gold & Silver Political Action Committee. If significant changes had not been made before the final vote, a new Texas law aimed at protecting consumers from some questionable, out-of-state "hotel gold buyers" probably also would have killed the legitimate business of many Texas numismatic companies. That legislation, HB2490, now has been signed into law by Texas Governor Rick Perry, but without the potentially devastating requirements for coin dealers and customers that earlier were contained in the bill. The elimination of burdensome, ruinous language from the bill was the result of constant monitoring of proposed legislation that could affect numismatic transactions, one-on-one relationships with supportive legislators and the assistance of an experienced lobbyist. These actions averted the potential company-killer mandates while still protecting the public when they sell precious metals in Texas. It's a lesson in vigilance that every dealer in every state should learn. Nationally-known rare coin dealer and precious metals expert Michael Fuljenz, is an award-winning numismatic author, frequent interview guest on radio and TV news and personal finance programs, and a community leader in his hometown, Beaumont, Texas. He hosts an award-winning, regularly-scheduled program about coins and precious metals on Newstalk 560 KLVI radio. It was another busy year for Mike Fuljenz. In addition to numerous local news media interviews in the Beaumont and Houston press, he was quoted in the Los Angeles Times, CBS Money Watch and Fox Business Network. He also won another five national excellence awards for his books, newsletters and consumer education efforts; continued his national service on the Board of Directors of the influential Industry Council for Tangible Assets; and became President of the Diocese of Beaumont Catholic School Board. Mike Fuljenz, of Beaumont, is not just the head of a thriving gold business with clients throughout the United States- though he certainly is that. The author, broadcaster and teacher is one of the most universally decorated coin experts of the last 30 years. His 2010 book "Indian Gold Coins of the 20th Century" , has quickly become a key resource for those interested in these beautiful collectibles. From his many appearances on CNBC and Fox News to his Beaumont radio show to his work guiding journalists as they attempt to navigate the Byzantine world of collectible coins and those who traffic in them, he has become a national figure. (Beaumont, Texas) – Coin expert Mike Fuljenz, of Beaumont, Texas has been honored with five national awards for excellence in print and broadcast journalism for his writings and reports about gold and the rare coin market. The five first-place honors established a new record for Fuljenz, and no individual received more awards in this year's competition. The awards were presented by the Numismatic Literary Guild (NLG), a nonprofit organization founded in 1968 that annually presents national awards to recognize outstanding journalism on the diverse subject of money from ancient to modern. Considered to be the epitome of writing and broadcasting excellence in this field, the 2010 awards were presented at the American Numismatic Association World's Fair of Money in Boston, Massachusetts on August 12, 2010. 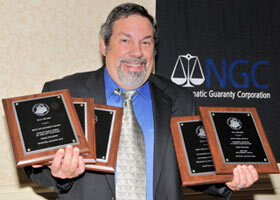 According to NLG Executive Director Ed Reiter, Fuljenz received the Best Radio Report Award (in conjunction with KLVI 560 in Beaumont) for his work regarding an on-going series of investigative stories urging consumers to be cautious when selling gold coins and jewelry to some traveling gold buyers.